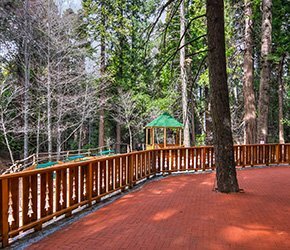 Arrowhead Tree Top Lodge offers the ideal venue for your wedding or group event in Lake Arrowhead, California. Celebrate in our spacious, level outdoor event area under a canopy of pine & dogwood trees. We have an elegant covered ceremony gazebo and a long aisle area for your dream wedding. We also have a raised outdoor reception area overlooking the ceremony area where you can dance the night away. Private wooded walking trails and a natural running spring create the perfect backdrop for pictures. 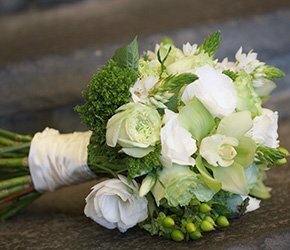 Host your entire wedding party on-site! We have enough rooms for up to 70 guests. 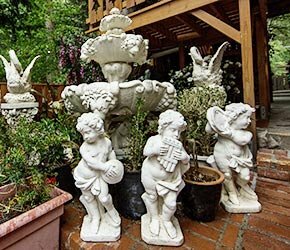 Your party will enjoy being within walking distance of Lake Arrowhead Village where they will find a variety of restaurants, shopping outlets, and fun. Private groups may also use our private conference room for parties up to 40 with access to our outdoor BBQ and group activity area. View our virtual tours to see our events areas. Please contact us so that we may assist you in planning your event.